Constructing a fault tree analysis diagram is quite beneficial for finding out the causes leading to the failure. It is a visual aid for management as well. Fault tree analysis (FTA) is a top down, deductive failure analysis in which an undesired state of a system is analyzed using Boolean logic to combine a series of lower-level events. 1. Identify failures and measures. The fault tree explicitly shows all the different relationships that are necessary to result in the fault or failure. In constructing the fault tree, a thorough understanding is obtained of the logic and basic causes leading to the top event. Using the logic of a detailed failure analysis and tools, FTA helps the team focus on the causes of each event in a logical sequence that leads to the failure. Furthermore, the countermeasures can be found out. 2. Highlight critical elements related to system failure. The FTA process may lead to a single component or material that causes many paths to failure, thus improving that one element may minimize the possibility of many failures. 3. Create a visual aid for system analysis and management. Apparently, most managers prefer graphics to text. The fault tree analysis diagram provides a framework for thorough qualitative and quantitative evaluation of the top event. And for complex systems, it helps to focus the team on vital elements. It is also a good way to identify weaknesses in a system. 4. Provides an effective way to analyze the system. Other tools permit a way to explore system reliability, and FTA provides a tool that focuses on failure modes one at a time. The fault tree is a tangible record of the systematic analysis of the logic and basic causes leading to the top event. Sometimes a shift in the frame of reference illuminates new and important elements of the system. 5. Expose system behavior and possible interactions. FTA diagram allows the examination of the many ways a fault may occur and may expose non-obvious paths to failure that other analysis approaches miss. As a result it helps to optimize tests and maintenances. 6. Account for human error. FTA diagram can include hardware, software, as well as human factors in a single graph as needed. The FTA approach is a comprehensive method by including the full range of causes for a failure. 7. Promote effective information communication. Such diagrams visually present information of system analysis in a clear and concise way. Staff within an organization can access and understand the analysis result better. Meanwhile, this approach also has some limitations. Fault tree analysis may lead to very large trees if the analysis is extended in depth. It depends on skill of analyst. Furthermore, it is difficult to apply to systems with partial success. Another shortcoming is that it can be costly in both time & effort. 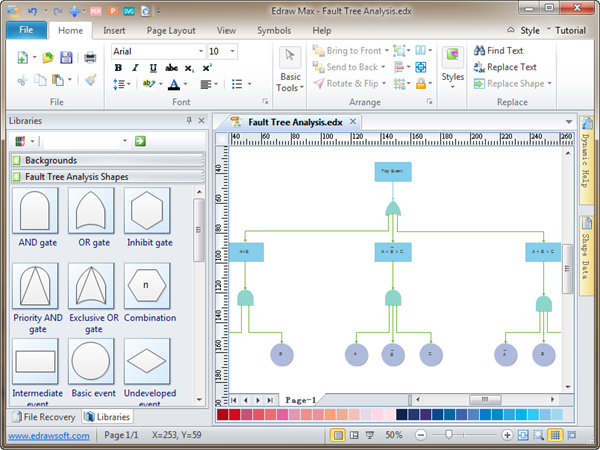 Edraw Max is vector-based diagramming software with rich fault tree examples and templates. 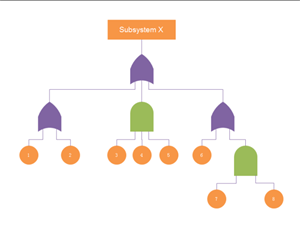 It is easy to create fault tree diagrams for its powerful functions and ease of use. Create diagrams which document events that might lead to failure so that failures can be prevented. A fault tree template is available in vector format, which is understandable at a glance. Use it to fresh for your own designs. 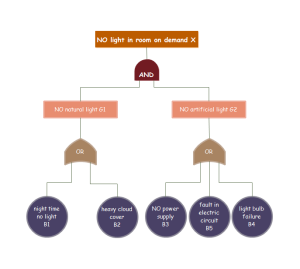 Use an editable simple fault tree template to ease your drawing process. All shapes are editable. You can change their fill color or pattern.